This Sunday, we begin what is called "Ordinary Time". The word "ordinary" does not mean normal or unimportant. In liturgy, it means ordered or numbered, from the Latin root ordinalis. It is the time between the high seasons of Christmas and Easter. And so, the readings for this Second Sunday in Ordinary Time remind us that God's love for us is like a sacred marriage covenant, like a young man's love for his bride, exuberant, with an abundance of generosity. Our first reading (Isaiah 62:1-5) is from a time when the Israelites were returning to Jerusalem after their long exile in Babylon. They were rebuilding their city of ruin. Isaiah's words gave them hope in the future, that God still loved them and would pour out his love upon them - "As a young man marries a virgin.". For Zion's sake I will not be silent, for Jerusalem's sake I will not be quiet, until her vindication shines forth like the dawn and her victory like a burning torch. Nations shall behold your vindication, and all the kings your glory; you shall be called by a new name pronounced by the mouth of the LORD. You shall be a glorious crown in the hand of the LORD, a royal diadem held by your God. No more shall people call you "Forsaken," or your land "Desolate," but you shall be called "My Delight," and your land "Espoused." For the LORD delights in you and makes your land his spouse. As a young man marries a virgin, your Builder shall marry you; and as a bridegroom rejoices in his bride so shall your God rejoice in you. 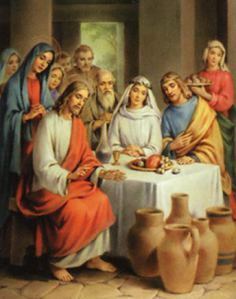 In our Gospel reading (John 2:1-11), we hear John describe the miracle of the wedding feast of Cana as the first of Jesus' "signs" or miracles. Jesus may have chosen this miracle and this setting to manifest his glory because of its corollary to the covenant relationship with God and for the overabundance of his love. Jesus could have made ordinary wine, but he chose to make the choicest wine. He could have made one jar, but he made six. It should also be noted, the trust his mother had in Jesus when she simply said, "Do whatever he tells you." There was a wedding at Cana in Galilee, and the mother of Jesus was there. Jesus and his disciples were also invited to the wedding. When the wine ran short, the mother of Jesus said to him, "They have no wine." And Jesus said to her, "Woman, how does your concern affect me? My hour has not yet come." His mother said to the servers, "Do whatever he tells you." Now there were six stone water jars there for Jewish ceremonial washings, each holding twenty to thirty gallons. Jesus told the them, "Fill the jars with water." So they filled them to the brim. Then he told them, "Draw some out now and take it to the headwaiter." So they took it. And when the headwaiter tasted the water that had become wine, without knowing where it came from - although the servers who had drawn the water knew -, the headwaiter called the bridegroom and said to him, "Everyone serves good wine first, and then when people have drunk freely, an inferior one; but you have kept the good wine until now." Jesus did this as the beginning of his signs at Cana in Galilee and so revealed his glory, and his disciples began to believe in him. In our Epistle reading (1 Corinthians 12:4-11), St. Paul reminds us that God, through his Holy Spirit, is the giver of all gifts. Each one of us has (at least) one spiritual gift from the Spirit, to be used in service to God and others. The gifts are all different as the Spirit chooses, "but one and the same Spirit produces all of these." Imagine if we lived in a town with all gas stations and no grocery stores or drug stores. How difficult life would be if God only gave one type of spiritual gift. We should rejoice and give thanks for the wide variety charisms the Spirit gives to his loved ones. It is the mosaic that portrays the image of a God so in love with his chosen ones that, "As a bridegroom rejoices in his bride, so shall your God rejoice in you." And so what shall we do? Do whatever he tells you.